If you have been wanting to book a session, but perhaps can't afford a full newborn session right now... Maybe you only just want a few images OR you want to buy someone this as a new baby gift ... then this might be perfect for you! 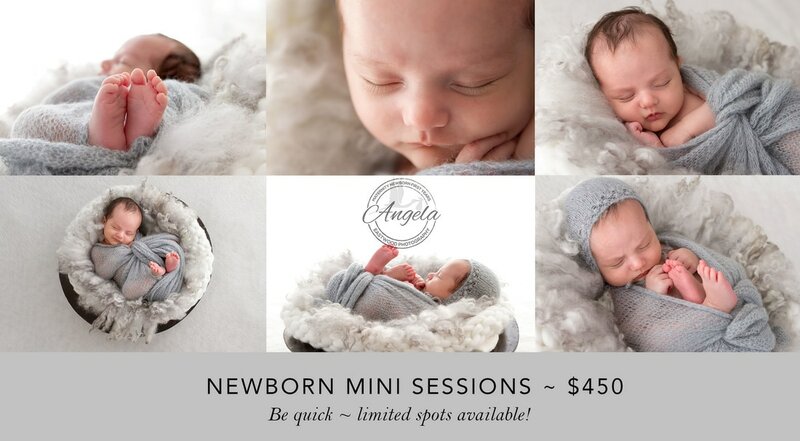 30-45 minute session with one of Christchurch's Leading Newborn Photographers. TWO setups of the parents choice with baby wrapped (excludes fully naked poses, family, sibling photos)..
6 fully edited digital images (colour & B&W versions so 12 in total). Via digital download. This is limited to 8 spots only. You must be due between now and end of February 2017. $100 non-refundable deposit required at the time of booking to hold your spot. Outstanding amount is due before your session. Session are 30-45 minutes long so if baby isn't asleep we will have to do awake/wrapped poses (these are still incredibly cute!). You get to choose what set ups you would prefer, and baby will be wrapped for all poses. See examples below. No family or sibling photos are included. Available for new bookings only.